The ventilator SPIRIT is a piece of design from conception. It was created 15 years ago and was inspired by a single-engine propeller. 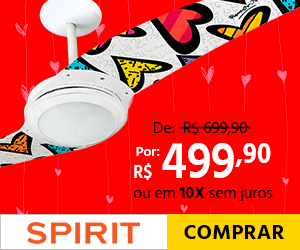 SPIRIT is a 100% national produtc and the most awarded in Brazil, and won 3 times the IF Design Award (considered the "Oscar of the design world"). 1. Sale 30% more than the others. 6. Take advantage of this campaign! 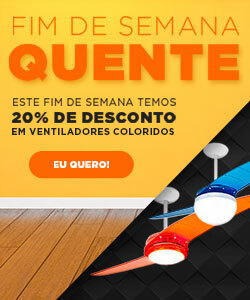 04/10/2018, 00:18 New promotions and banners in Spirit - ventiladores! 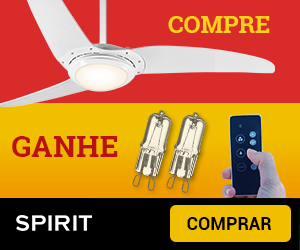 28/09/2018, 20:53 New promotion and banners in Spirit - ventiladores! 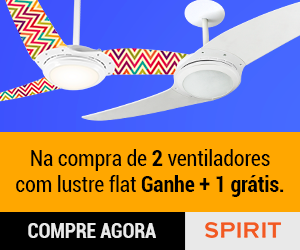 27/09/2018, 18:40 New promotion and banners in Spirit - ventiladores! 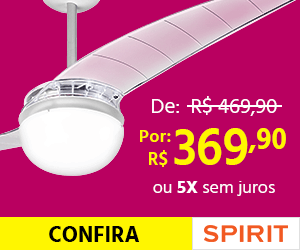 25/09/2018, 17:52 New promotions and banners em Spirit! 10/09/2018, 22:01 New promos and banners in Spirit! New promos and banners in Spirit! 05/09/2018, 21:35 New promotion and banners in Spirit! 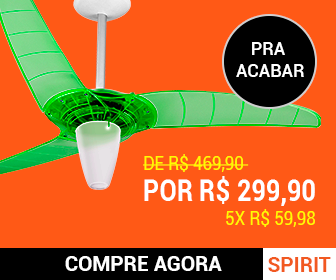 03/09/2018, 23:37 New banners in Spirit ventiladores! 28/08/2018, 22:34 New promotions and banners in Spirit! 17/08/2018, 18:45 New promotion and banners in Spirit! 08/08/2018, 19:25 New promotion and banners in Spirit! 25/07/2018, 21:28 New promotion and banners in Spirit! 20/07/2018, 22:20 New coupon at Spirit! 17/07/2018, 18:10 New promos and banners in Spirit! 03/07/2018, 18:06 New promotion and banners in Spirit! 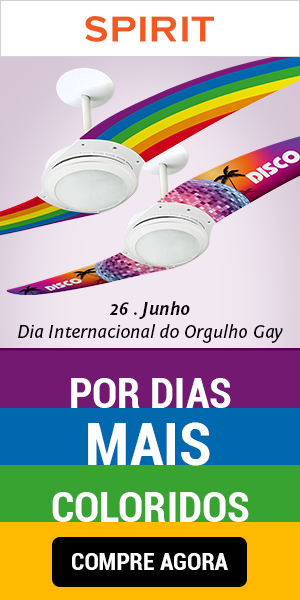 28/06/2018, 17:25 Promotion extended in Spirit ventiladores! 22/06/2018, 20:46 New promos and banners in Spirit! 19/06/2018, 20:36 New promos and banners in Spirit! 06/06/2018, 22:51 New promos and banners in Spirit! 24/05/2018, 23:34 New promotions and banners in Spirit! 14/05/2018, 22:52 XML available in Spirit! 09/05/2018, 22:12 New promotion and banners in Spirit! 07/05/2018, 22:29 New promotions and banners in Spirit! 20/04/2018, 21:43 Extension of promotion in Spirit! 18/04/2018, 18:02 New promotion and banners in Spirit! 04/04/2018, 20:25 New promotion and banners in Spirit! 26/03/2018, 22:16 New promotion and banners in Spirit! 15/03/2018, 20:14 Consumer Week: New promotion and banners in Spirit! 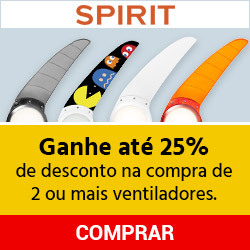 25/01/2018, 19:54 New promotion and banners in Spirit ventiladores! Save up to 25% off the purchase of 2 fans. 18/01/2018, 20:18 New proms and banners in Spirit! New proms and banners in Spirit! 11/01/2018, 21:28 New promotion and banners in Spirit! 05/01/2018, 20:02 New Promotion, Coupon and Banners in Spirit Fans! 26/12/2017, 21:44 New promotion and banners in Spirit ventiladores! 19/12/2017, 17:33 New promotion and banners on Spirit fans! 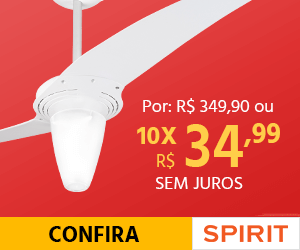 05/12/2017, 21:47 New discount coupon on Spirit fans! 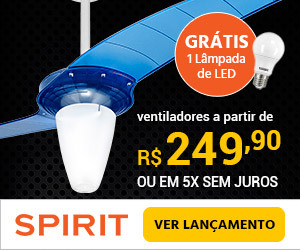 23/11/2017, 19:32 New promotion and banners from Black Friday on Spirit fans! 22/11/2017, 19:46 New promotion of Black Friday in Spirit fans! 27/10/2017, 19:55 New promo and banners in Spirit! New promo and banners in Spirit! 04/10/2017, 21:46 New banners in Spirit! Customer Day - Buy 2 Take 3! 11/09/2017, 23:00 New promo and banners in Spirit! 29/08/2017, 21:49 New promo and banners in Spirit! 18/07/2017, 21:59 New promo and banners in Spirit! 17/07/2017, 23:37 New promos and banners in Spirit! 12/07/2017, 21:19 New promo and banners in Spirit! 05/07/2017, 21:38 New promos and banners in Spirit! 21/06/2017, 21:44 New promos and banners in Spirit! 13/06/2017, 00:00 New promos and banners in Spirit! 01/06/2017, 20:31 New promos and banners in Spirit! 19/05/2017, 21:00 New promos and banners in Spirit! 12/05/2017, 19:29 New banners in Spirit campaign! New banners in Spirit campaign! 05/05/2017, 22:42 New promo and banners in Spirit! 27/04/2017, 21:54 Mothers day promo in Spirti campaign! 19/04/2017, 21:03 New banners in Spirit campaign! 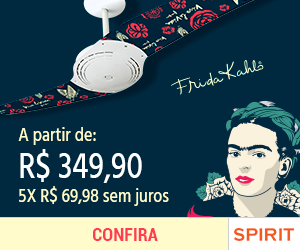 Fans frida kahlo 25% OFF! Enjoy it! Valid only until 19/04. 07/04/2017, 21:05 New banners in Spirit campaign! Send your traffic and start earning a lot more! Get up to 25% discount in purchases of 2 or more fans. During Spirit's anniversary there will be a week of super deals on the site. In addition, the commission will increase from 7.69% to 11.54%. 03/03/2017, 05:37 Pre-birthday at Spirit. New banners in Spirit offer! 07/02/2017, 21:46 New banners in Spirit offer! Enjoy the promo, valid until 12/02! Don't waste more time and start earning more! Amazing promotions! Check and start earning more! 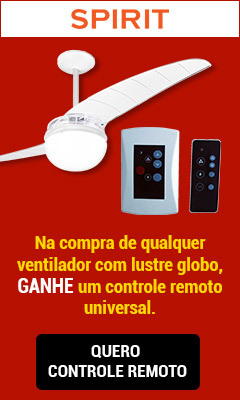 The entire site with payment in up to 12x, with minimal installment of R$20,00. Enjoy, valid just until 12/10. 26/09/2016, 21:08 New promotion at Spirit offer! 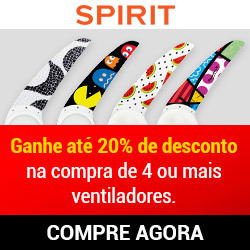 New promotion at Spirit offer! 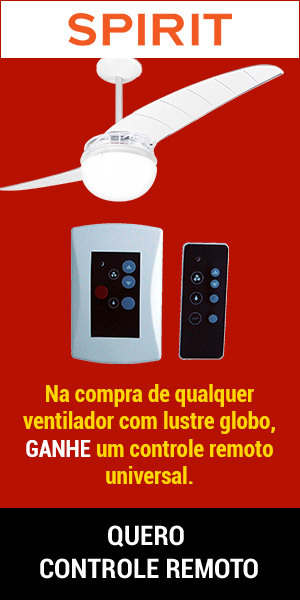 Buying any fan with the globe, get a remote control for free! Check it out! Promo valid just until 28/09! Get up to 20% discount when buying 4 or more fans. Buying any fan with the globe light, get a universal remote control. New links and coupons at Spirit offer! Coupons are non-cumulative with other promotions on the site! 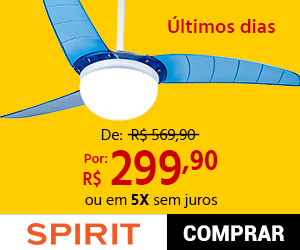 29/07/2016, 22:59 New Fathers Day banners and promos at Spirit offer! It is Fathers Day at Spirit! Enjoy the promos! Get a full set of tools when buying any flat fan! 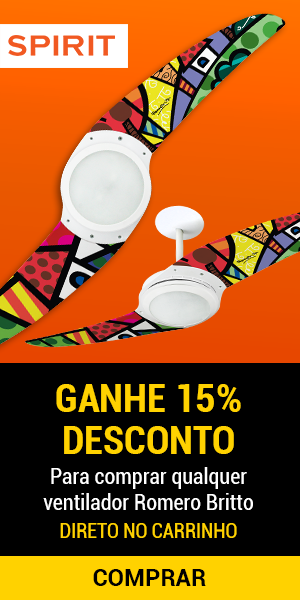 Get 15% discount buying any Gustavo Rosa fan! Come soon, offer valid just until 17/07! New banners at Spirit offer! Get 15% discount buying any Romero Britto fan! New promo at Spirit offer! Buying 2 pieces with flat light, get +1 free. Don't waste time and promote right now! 04/05/2016, 23:27 Mother's Day at Spirit! Check the exclusive ventilators for this holiday! Run and enjoy, just until 08/05! 07/04/2016, 19:35 New exclusive discount coupon at Spirit offer! 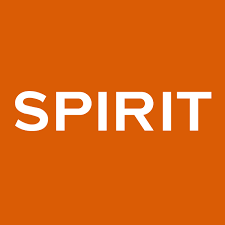 New discount coupon at Spirit offer! Check the exclusive coupon that Actionpay is offering to Spirit offer! Don't waste time and start now, coupon valid until 09/05. 11/03/2016, 18:13 New banners and text links at Spirit offer! New banners and text links at Spirit offer! Check them out and earn much more! 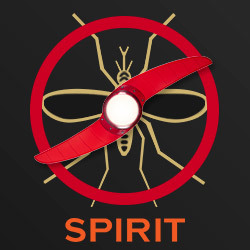 Spirit is doing an action to show which ventilatos are helping to combat Zica. Check it out and get yours! 12/02/2016, 20:02 New text links at Spirit offer! Come, check and start to win more right now! The ventilator SPIRIT is a piece of design from conception. It was created 15 years ago and was inspired by a single-engine propeller. 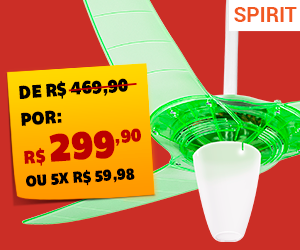 SPIRIT is a 100% national produtc and the most awarded in Brazil, and won 3 times the IF Design Award.